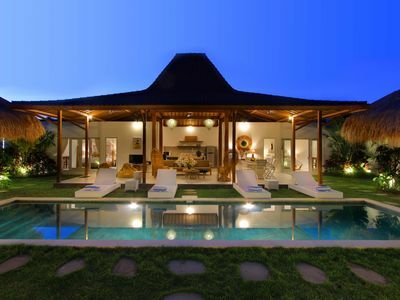 Villa Natayani features the hottest location in town: right on the renowned and always happening Eat Steet in the Oberoi district of Seminyak. 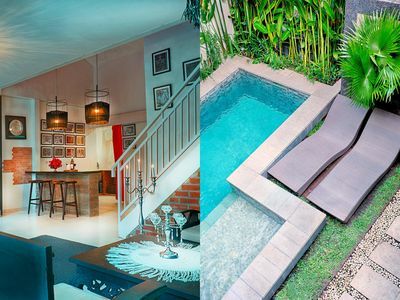 There will be no shortage of entertainment this holiday with so many boutique shops, dining venues and famous beach clubs in walking distance of your home away from home in Bali. 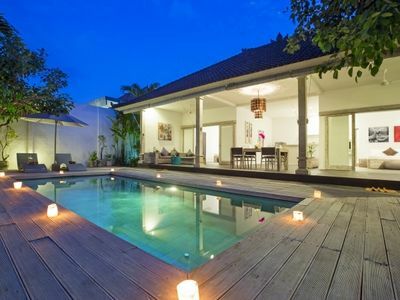 You will be welcomed in the tranquil, private tropical garden of Villa Natayani, surrounded by lush local greenery and scenting frangipani trees. The crystal clear swimming pool couldn't look any more inviting as it shimmers in the sun, inviting you to jump in on the spot. 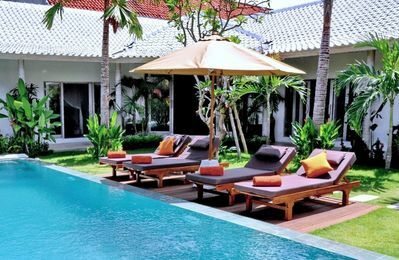 By the poolside, you can work on your holiday tan or find shade in the traditional balé, reading a book, enjoying a daytime snooze or pampering yourself with a traditional Balinese massage in the comfort of your own private garden. 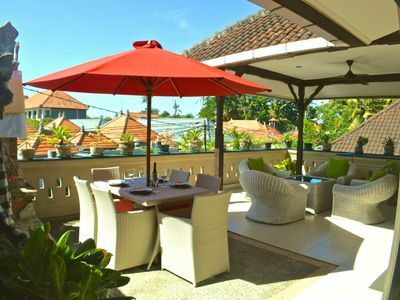 The breezy veranda makes another nice shady spot to sit and enjoy drinks together to the wonderful garden and pool view. 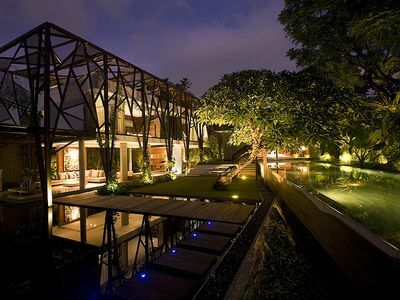 Villa Natayani features a stylish, contemporary living pavilion soaked in natural sunlight through the floor-to-ceiling glass doors that slide open to the garden. 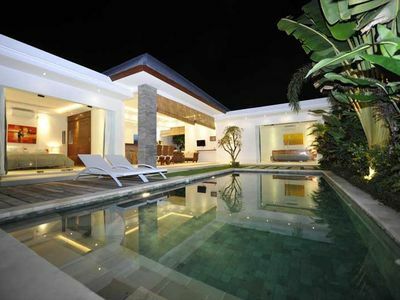 The elegant, light-filled living room of the villa is ruled by warm earthy colors and local timbers. There is a modern fully equipped kitchen found inside, complete with a large fridge, a juicer, stove, microwave and a long bar and 4 bar stools to sit together, enjoying drinks and snacks. On the other side of the room, you can lounge the day or evening away on the comfy L-shaped sofa or curled up in the armchair. The sofa lounge faces a large flat-screen TV with 60 international channels, Bose surround-sound speakers, and a DVD-player, providing entertainment for all of the guests staying at Villa Natayani. A collection of movies is available. Just perfect! 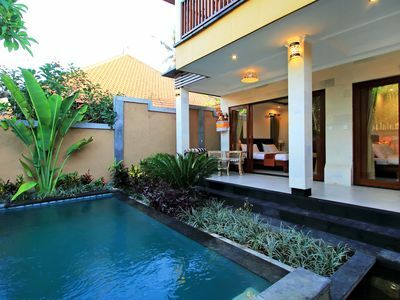 With 2 deluxe air-conditioned villa suites, Villa Natayani can accommodate up to 4 guests comfortably. After a perfect night sleep on the crisp white canopied double beds, guests get to wake up to the lovely view of the garden and pool. 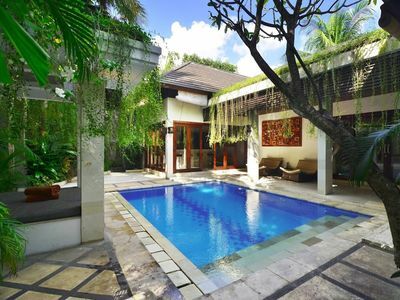 Wake up slowly with a hot cup of coffee on the veranda, before plunging into the crystal clear water of the pool and munching a delicious tropical breakfast in the garden or the living room. Each room has a private en-suite bathroom to enjoy a hot or cold shower or a long relaxing bathing session. Bathroom guest amenities are catered for and personal safety boxes are available as well to store your valuable items. 2 Bedroom near Echo Beach, Private Pool, Housekeeping staff, Good Rate!